We have thousands of properties for sale all over France. But we've no property for sale in Combourg at the moment. And that's something we want to change. If you have a property to sell in Combourg (or nearby) then act now to get a 50% discount. Just place your advert in the normal way (Click here to place your advert). Then send us an email quoting "Combourg" and telling us that you you saw this offer. Combourg is a small mediaeval town found in the eastern part of Brittany, in France's north-west. It is a town beloved of both lovers, and also of literary fans and romantics. The town is well known as the birthplace of romance. This is partly due to it being the home town of the famous French writer Chateaubriand, and also because of its beautiful castle and lake. Combourg is a delightful town which retains many original mediaeval features and buildings. Take a walk around the ancient streets and you will find many beautiful examples of the half-timbered houses which are the distinctive mark of mediaeval architecture in France. See in particular, the Lantern House, or the Palace of Princes. As well as the colombage houses, Combourg also has some elegant granite built houses, and this intriguing blend of architectural styles combines to create the character and charm that is Combourg. 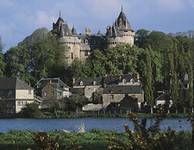 The home of the great French writer Chateaubriand, Combourg Castle, stands today charming all who see it, with its unusual "witches cap" towers and impossibly romantic setting beside the lake. Some of the woodlands mentioned in Chateaubriand's writing are no longer there, but there is enough left to create a substantial literary heritage from which the town benefits today as a tourist trap. There is a literary trail which you can follow, walking in the great writers footsteps. The theme of romance continues in the town's restaurants and bars, with a charming and seductive ambience seemingly ever present. There are many fine places to eat, and you can choose from the simple but delicious fare found in the little crêperies, to the best of gourmet food served in the top restaurants. Combourg is also well equipped to please on the shopping front, and it is easy to spend several hours enjoying the boulangeries, chocolateries, patisseries and many more! Combourg has a cinema, so you can catch up with all the latest films, and a public swimming pool too, for burning off all the calories consumed in the crêperies! Brittany is a beautiful region, and not only is it all there to be explored and enjoyed from a base in Combourg, but also you have easy access to two other regions: the Pays de la Loire, to the south, and Lower Normandy to the north. Take a day to explore the great city of Rennes, or visit the lovely coast at St Malo. If you are feeling active try some of the many sporting activities on offer in the locality. These include golf, horse-riding, tennis, fishing, swimming and walking. Nearby towns also offer woods, aquariums and even a reptilium where you can observe alligators and crocodiles at close (but safe!) quarters... so you certainly wont be bored! There are several options when it comes to choosing how to travel to Combourg. You can fly to Rennes or to Dinard, or you can take a TGV train to Rennes having travelled to Paris by Eurostar. (Rennes is served by flybe and Aer Lingus and Dinard by Aurigny and Ryanair.) It is also possible to travel by boat, catching a ferry to St Malo, Ouistreham (Caen) or Cherbourg. 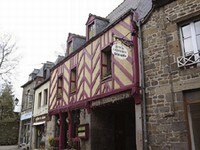 Brittany is an ever popular area with house hunters, especially with the British as it is easy to access from the UK. This tends to push prices up, but also means that property here will hold its value and sell readily. Rental income from a property in Combourg is also very possible, as the town is a popular holiday destination. Do you know Combourg better than we do? Do you have photos of Combourg? Combourg is located in eastern Brittany, in the north-west of France. It lies in the north of the Ille-et-Vilaine department. Access: By air: Fly to Rennes (flybe, Aer Lingus), or to Dinard (Aurigny, Ryanair). By boat: The nearest ferny ports are those of St Malo, Cherbourg and Ouistreham (Caen). By rail: The TGV can take you to Rennes from Paris. Economy: The economy of this small town is largely dependant on tourism and traditional rural industries. Interesting fact: The town is classified as a "petite cité de caractère"... a small town of character.